1. Prices include transfers from your hotel, balloon flight and a light champagne breakfast. 2. There are 16 pax in a balloon for classic service. Premium balloon flight accommodates 8 pax only offering more privacy in a separate compartment (two persons). 3. Pregnant women will not be permitted to fly. 4. Any Passenger in excess of 125 kg / 280 pounds, or any passenger who requires the space in the basket for 2 passengers, will be required to pay a 100% surcharge of the ticket price. Failure to provide accurate information in advance could lead to the refusal of flight at the launch site, whereby no refund will be offered. . 5. No refunds will be given for failure to arrive for a pre-arranged flight. 6. 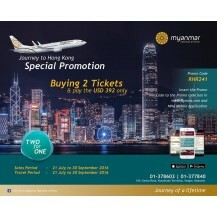 Receipt of payment vouchers / flight tickets must be produced at launch site. 7. 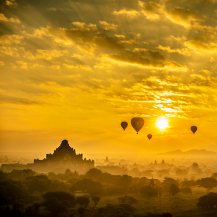 Balloons over Bagan will not fly children under the age of 8 years. A child under the age of 16 years will only be flown if accompanied by a responsible adult, and the child is over 4&#039; 6&quot; tall (or 137 cm). 8. If the balloon flight is cancelled due to the bad weather, we will refund the full amount. Day 1: Yangon arrival &amp; sightseeing (by car) Arrive at Yangon International Airport and welcome by Asia Graet Travels representative and our tour guide. Check in hotel. 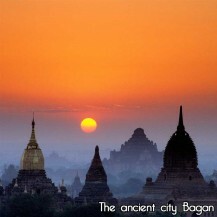 Yangon sightseeing includes; the Royal Park, one of the most popular green spaces in the downtown area of Yangon. Here you see the glittering Karaweik Barge, a replica of the Royal Bridge and enjoy the view over the lake up to the ShwedagonPagoda.Visit to the city center with the gilded 2500 years Sule Pagoda. And visit colonial style buildings surrounding Mahabandula Park. Then drive to stroll through a narrow street of China Town including the short visit to Tao Temple. Then, shortly before sunset, the 107 meters high golden stupa of Shwedagon Pagoda will glitter in the soft light of the early evening. Overnight at hotel in Yangon. Day 2: Yangon – Bago – Kyaikhtiyo (Golden Rock) (by car) After breakfast at hotel, drive to Kyaikhtiyo and on the way Bago sightseeing. Visit to Kyat Khet Wine Monastery, where a thousand monks take their last meal of the day at 10:00 am in total silence. 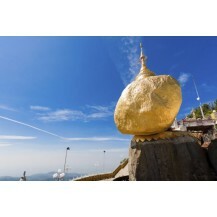 Then continue to Kyaikthiyo, one of Myanmar’s landmark, which is famous for its position and religious importance: Kyaikhtiyo the “Golden Rock “, huge boulder completely covered by gold leaf and delicately balanced on the edge of a cliff. To reach the pagoda from Kin Pun a steep 11km road leads to the upper staging point by truck. Take a light trekking on the summit through bamboo forest. Enjoy the sunset beauty on the hill top and overnight at the hotel in Kyaikhtiyo. Day 3: Kyaikhtiyo (Golden Rock) – Bago – Yangon (by car) After breakfast at hotel, take a half hour walk to small cave. Also stop at the roadside shops for rare product of jungle, Midmorning, drive down to the base camp and return to Yangon. On the way visit most important sights of this old capital of the Mon People. Visit in Bago sightseeing: Shwemawdaw Pagoda, Hinthargone Pagoda and KanbawzaThardi Palace built by King Bayinnaung.Then visit in and Shwethalyaung Pagoda (the world&#039;s most beautiful reclining Buddha) and MahaZedi the Mon style. Then visit to Chinese Kwanyin Temple and a walk around the colorful Bago Market. 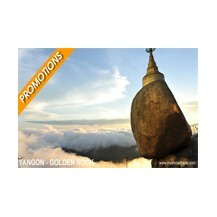 Visit also and the huge 4 sitting Buddha&#039;s &quot;Kyaikpun&quot;(28 meter high huge Buddha Image). After that, drive back to Yangon and on the way visit the Allied War Cemetery near Htaukkyan, the final resting place for over 27,000 allied soldiers. Overnight at hotel in Yangon. Day 4: Yangon sightseeing &amp; departure (by car) After breakfast at hotel, visit to National Museum. After lunch visit in Bogyoke (Scott) Market where you can buy many souvenirs.Thne transfer to Airport for departure. One of the most important Buddhist pilgrimage sites in Myanmar, located in Mon State, 170 km away from Yangon. It is a pagoda above the rock is about 7.3 meters in height, build on the top of a granite boulder covered with gold leaves pasted on by devotees, which balances on the cliff. The balancing rock seems to defy gravity, as it perpetually appears to be on the verge of rolling down the hill. The rock and the pagoda are at the top of Mt. Kyaikhtiyo 1100 meters above sea-level. 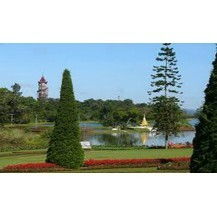 Pyin Oo Lwin was formerly known as May Myo. 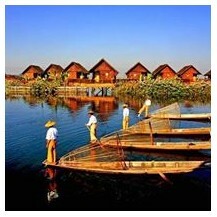 It is a resort town in Mandalay Division in Myanmar, located some 67 kilometers east of Mandalay. Pyin Oo Lwin is also known as &quot; Pan Myo Daw&quot;, means &quot;The City of Flowers&quot;, for its different species and colorful flowers grown intensively. During the British colonial occupation, the British, in 1896, developed it as a hill station because of its cool alpine climate, especially during the hot season. It is also well known for its colonial style houses with large compound and pine trees, unique horse carriages in town. Knitted sweaters, wines, Strawberry jams and various fresh fruits are popular products of Pyin Oo Lwin. Organic ground coffee from local plantations is good enough for export, as well. U Bein Bridge is a crossing that spans the Taungthaman Lake near Amarapura in Myanmar. The 1.2-kilometre (0.75 mi) bridge was built around 1850 and is believed to be the oldest and longest teakwood bridge in the world. Construction began when the capital of Ava Kingdom moved to Amarapura, and the bridge is named after the mayor who had it built. It is used as an important passageway for the local people and has also become a tourist attraction and therefore a significant source of income for souvenir sellers. It is particularly busy during July and August when the lake is at its highest.